What do you do if your novel product is seemingly better for the environment and lasts longer than the industry standard but is more expensive upfront? How do you persuade the industry that it is worth investing in your product? The answer for one of our clients has been to commission a life cycle assessment which demonstrates that its product has a carbon footprint 5x smaller than the industry standard. Currently cables are run alongside the railway tracks in heavy concrete troughs. Our client, Trojan Services Ltd, produce an innovative alternative made from plastic recovered from scrapped cars. They produce a variety of troughing solutions for the rail sector: TroTrof, TroTred and TroPath (which encompasses a pathway for engineers to use when carrying out inspections). While using recycled plastic sounds good, Trojan needed to demonstrate to its clients the real impact using a Tro product could make compared with concrete. Enter Ricardo. Our life cycle assessment (LCA) experts have done precisely this for a number of clients. Like any good assessment, our experts started the project with some thorough data collection and site visits all along Trojan’s supply chain. This covered the companies involved in shredding scrapped cars to recover the metal (who had previously been treating the plastic component as a waste product), refining the shredded plastic in to filled polypropylene (fPP) granulate and injection moulding the fPP into Trojan’s product. Our team used the detailed data collected at each step of the process to develop a mass and energy balance. We fed this information in to the life cycle analysis software, SimaPro, to develop a series of processes and assemblies that built a picture of how each stage of the production, transportation, installation and removal processes stacked up. We also carried out research in to the concrete alternative, sourcing data from relevant stakeholders. The work enabled us to provide Trojan with comparable life cycle assessments for its products and the concrete alternative, detailing the impact each product has on the environment per km of trough installed and removed at the end of its life. 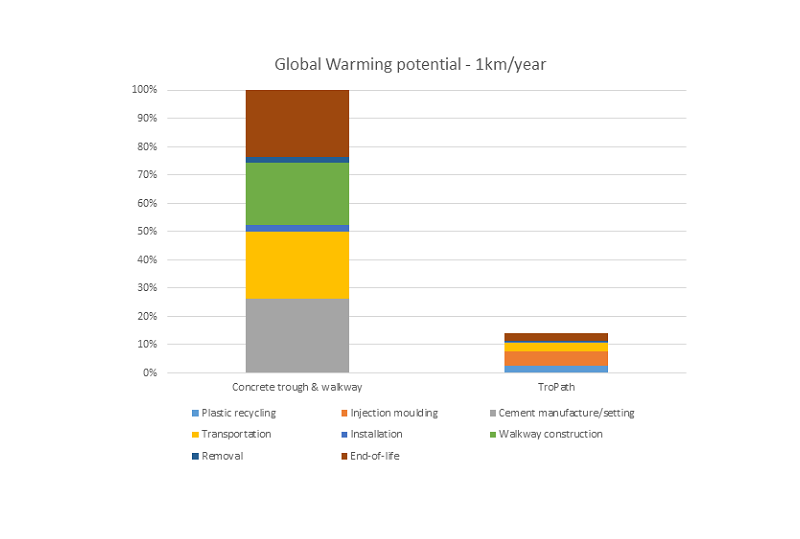 The chart below illustrates the strong environmental credentials of Trojan’s alternative to concrete troughs. Indeed, TroPath, which eliminates the need to construct a separate pathway for engineers has a global warming potential impact over 5x times smaller than traditional concrete troughs and pathways. Trojan is now using the information from our study in its conversations with the rail network to demonstrate its environmental benefits. Results like these can be used to develop a formal Environmental Product Declaration (EPD) which can be presented to multiple potential purchasers as transparent and consistently prepared evidence of the product’s environmental credentials. “We’ve always prided ourselves on our products’ environmental performance, but having this demonstrated robustly by a reliable external party has provided us with valuable evidence to present to our customers. We are very pleased with the service Ricardo has delivered”. For those interested in the nuts and bolts of LCAs, the transport element of this project was particularly interesting. Normally this stage is negligible compared with the production processes. However due to the weight of concrete troughs and the recycled content of Trojan’s troughs, the transport processes were a significant factor in the global warming impact of 1km of trough. This exercise is not just about being seen to be green. It has a direct impact on purchasing decisions. Increasingly public sector bodies are asking for some sort of environmental impact assessment such as an EPD as part of their procurement process. In the case of Trojan, the information we developed was directly used as part of their negotiations with a major rail network. This sort of requirement is likely to become ever more crucial to tendering and procurement. The ISO standard ‘Sustainable Procurement Standard’ is due to come forward this March, building on a British Standards Institution (BSI) Standard from 2010. We will see this form part of public sector procurement in particular, which accounts for around 12% of GDP and 29% of government expenditure in OECD member countries. For more information on the new standard click here. Being able to quantifiably demonstrate the environmental credentials of your product shouldn’t be viewed as a CSR opportunity but a competitive necessity. Developing an LCA or an EPD is an effective and transparent declaration of your product’s environmental impact.